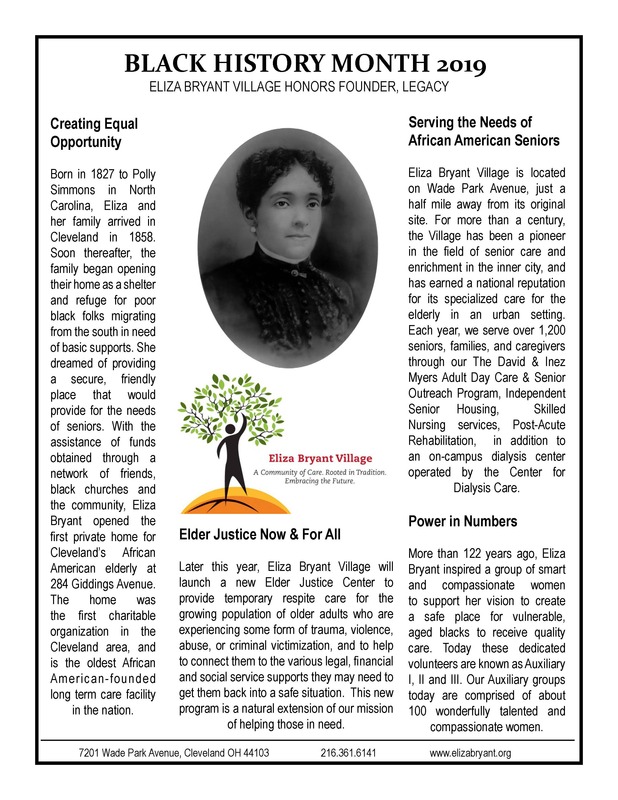 Every month is Black History Month here at Eliza Bryant Village. However, February gives us a special chance to reflect on our legacy and the people who inspired positive change for black and other marginalized people. This year’s national theme for Black History Month, “Black Migrations”, is particularly relevant here at the Village. Our founder, Eliza Simmons Bryant, herself a migrant from North Carolina, helped generations of other migrants to the area in need of care, as part of an enduring mission “to provide quality services, outreach programs and a dignified, compassionate and secure living environment for seniors.” Today, we are challenged to find innovative solutions to help the vulnerable seniors we serve overcome varying hardships. To successfully implement these initiatives, we remember Eliza Simmons, our visionary founder for inspiration.